Charity has always been close to my heart, and I tabik spring to these girls for organising this Charity sale! 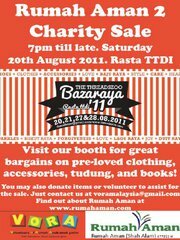 "Great bargains for a good cause on pre-loved clothes, accessories, tudung, and books! 100% (yes, ALL) proceeds go to the building of Rumah Aman 2 in Sungai Buloh, which is currently under construction and requires another 2 million to complete. It will be another home providing care and education to another 80 children, orphaned and from the poor and destitute. Please visit www.rumahaman.com for more information on Rumah Aman 1 ...(Shah Alam) and Rumah Aman 2. Come find us at Bazaraya '11 and tell all your friends and family too! If you wish to donate items for sale (please make sure they are in good condition) or to volunteer your time, you may write to voramalaysia@gmail.com or leave a message here on our event wall. Note: for donation of clothing/accessory items/tudung/books, as announced in the wall below, please direct your contact to our admins Suraya/Durra and arrange for collection/passing of items to us BY THE 18th of AUGUST 2011. This is an effort by Volunteers of Rumah anak-anak yatim (VoRA) . Rumah Aman is VoRA's first project. " Pleasures in my Life: I'm sikat-less! Turun berat masa bulan puasa: Betul ke tipu? Pleasures in my life: Best ke Egypt?